Yeah, I know Rio is not a place where jackets of any kind, or staying warm, is really necessary, but this jacket is so cool you’ll want to wear it, no matter where you are. 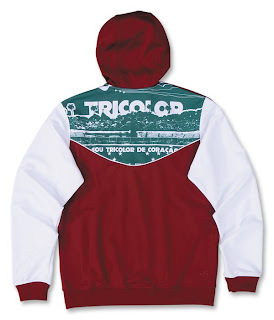 You might not be able to hang out in Rio de Janeiro, where the high today is a balmy 80°, you can still rock this cool hoody jacket, with sweet Brazilian style. And if you happen to be from Brazil and miss your warm homeland, this jacket will take you back in spirit, and is sure to keep you warm. It’s such a unique track top/hoody, that you could use for it for running, training, doing a remake of the Carmen Miranda hit That Night in Rio, or just to paint the town: BE SEEN IN TRICOLOR STYLE. It runs a bit large, as I wore a large, with three layers underneath, as it was in the teens in Birmingham today. The jacket was thicker than I expected, with a silky smooth material—the material inside the hood though, is especially soft on your head, nice for any bald men out there like me. I love the Tricolor graphic on the back, which says ‘SOU TRICOLOR DE CORACAO’ (if you’re not fluent in Portuguese that means ‘I am Tricolor from the Heart) The three colors contrast underneath the shoulder stripes, flowing with the current style the young, hip kids are wearing, so this one won’t be around too long. I’d better take this one off and send it back quickly, though I’m real tempted to buy it.